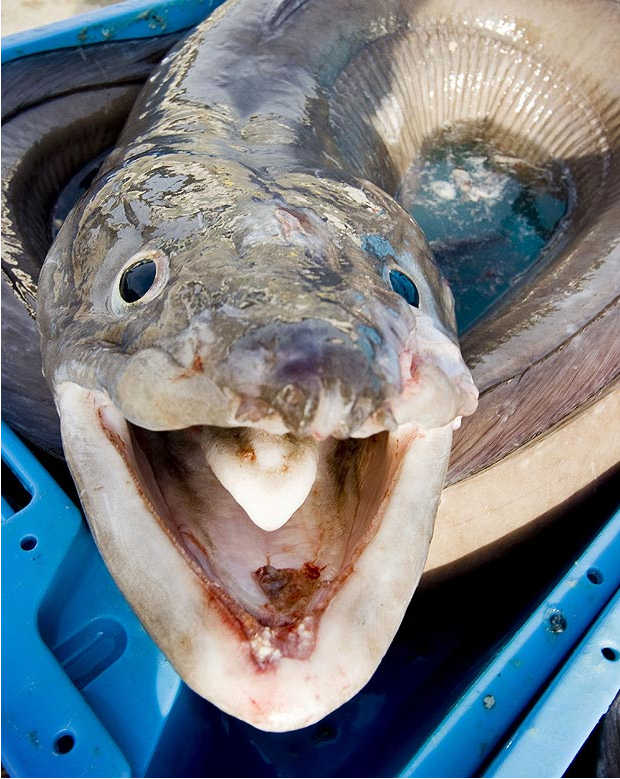 A couple of years ago I featured a link of a clip from BBC program featuring conger eels on the west Irish coast, and admitted that whilst other fear sharks or jellyfish, my irrational open water was conger eels. I’ve only ever seen them in aquariums but their predatory ugliness tends to remain in the mind. The relevant part begins at 1:40. Monty Don has a different idea of beauty than I do. That video clip implies congers are not as dangerous as their reputation. However a recent case of an unprovoked conger eel attack on that self-same west Irish coast would seem to indicate otherwise, that while exceedingly rare, conger eel attacks can occur. While on the way to the Skelligs swim last weekend one of the Irish tabloids had the front page headline … wait for it …Devil eel ate my face. I’d heard the interview of the scuba diver who’d been attacked on the radio, but the podcast of it didn’t last long enough I’m afraid. However one of the Irish papers carried the story also. Old congers lose their teeth. They’re still ugly. “Suddenly I got hit with what felt like a really strong punch in the face,” Mr Griffin told the Herald. “I felt like a rag doll. It gripped onto my face and threw me about violently. 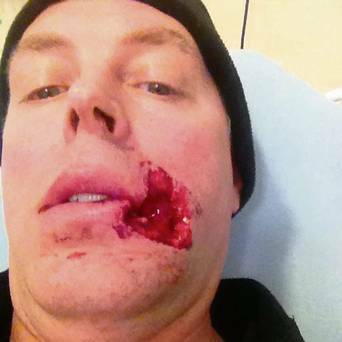 It was biting, pulling and twisting on my face,” he said. “I got this horrendous feeling of numbness in the left side of my face,” he added. “My regulator fell out and my vision became really cloudy because of the blood rising in the water in front of me. The owner of a bakery shop on Shop Street, Galway city, Jimmy has over 200 logged dives to his name, so knew that he had to remain calm in the situation. “I couldn’t panic – we were 25 meters under water. My regulator (breathing apparatus) had been knocked from my mouth, so to panic would have made the situation a whole lot worse with the risk of drowning. The good news for Mr. Griffin is “[t]he plastic surgeons have done a fantastic job. I don’t even know how many stitches I have on both the inside and outside of mouth but they say the scar will eventually be unnoticeable,” he said. I always like the line in the video above, a third of their weight [becomes] gonad. Sweet dreams. Carnivorous fish seem to be a mistake. Culling the conger eel population may be of advantage. I got bit by an eel recently. It was an unprovoked attack; it was definitely not defending itself in any way, shape, or form. Do not mess with eels. It’s been almost a week and my wounds have barely healed. That’s Monty Halls, not Monty Don. I have never seen Monty Don with an eel although that would make for a good gardening programme as would Monty Halls waxing lyrical about his dahlias whilst diving. Why can the BBC mix themes up a bit more? Yes, someone else told me this also. Thanks! Thanks Owen, I must change that picture so. 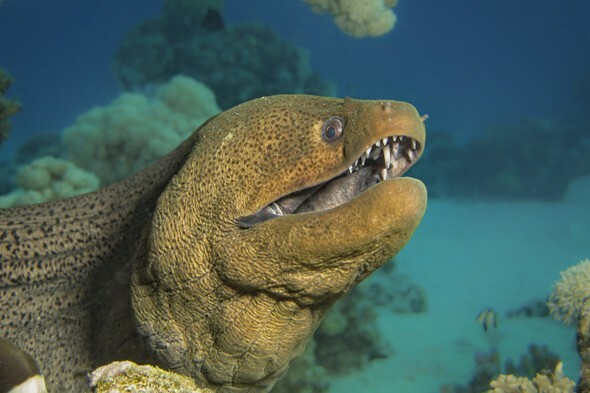 I think my dislike of eels stems from some schlock paperback book on Moray eels I read when I was a kid around the time Jaws came out. Your braver than I am swimming in Port Philip Bay and Steve’s early stuff was great before all the acting took the grit out of it. I love that missing chunk of face! At last I have a story to compete with the blase Aussies who barely bat an eyelid at the various forms of native fauna that can kill a man (or woman) dead with a mere glance. Let’s hear it for the unsung monster (til now) of the the Irish seas (and fjiords). Very satisfying post (oh alright, and slightly scary too)! G;Day Dara you are right in the sense that Aussies can appear blasé when it comes to the venomous and poisonous. Growing up watching the late Steve Irwin and the legendary Les Hiddens ‘The Bush Tucker Man’ is probably partly responsible for the no worries she’ll be right mate attitude. Regarding Australia I think that if the information is from a good source then we learn pretty early on that snakes for example do not leap to bite people. Spiders are the same and sharks too they aren’t hunting humans. We just kind of learn to live with them I guess. I have my fair share of stories when it comes to Australia’s most deadly and I can tell you it can be pretty heart stopping stuff! Nice to meet you and thanks for sharing your thoughts and your own conger perspective. Yeah, I am afraid the late Steve was not the greatest advocate of leaving animals to their own devices. I am unfamiliar with Les Hiddens but I will try and find out about him. That River Monsters is a shocker alright! The weight comparison you mention gives lots of food for thought, and hopefully not food for the conger. I think I’ll be safe enough in the cooler waters of Port Philip Bay where the locals have been assuring me since I got here in 2010 contains nothing life-threatening. Thanks, it’s just another thing to worry about in the water.